This report on the cancer supportive care products market analyzes the current and future scenario of the global demand and provides evaluations as well as estimations for the forecast period of 2017 to 2021. The report has been prepared by experienced and professional research analysts and aspires to serve as a credible business tool for its targeted audiences such as academic research institutes, drug manufacturers and suppliers, hospitals and clinics, research and development (R&D) companies, medical research laboratories, and academic medical centers and universities. The report includes market profiling on the basis of in-depth secondary research that was used to ascertain overall market size and conducted interviews with industry experts and drug manufacturers. The formulated data has been validated by triangulation method, in which secondary, primary, and PMR analysis contributed majorly. This global cancer supportive care products market report comprises of an elaborate executive summary, which includes a market snapshot that provides information about various segments of the market. It also provides information and data analysis of the global market with respect to the segments based on drug type, indication or cancer type, distribution channel, and geography. A detailed qualitative analysis of drivers and restraints of the market and opportunities has been provided in the market overview section. In addition, the section comprises dynamics of the market, supply chain, cost structure, pricing analysis, raw material sourcing strategy and analysis, and supplier list. This section of the report also provides market attractiveness analysis, by geography and market share analysis by key players, thus presenting a thorough analysis of the overall competitive scenario in the global cancer supportive care products market. The primary research of the report included information from LinkedIn, Zoominfo, Salesforce, and avention, whereas the secondary research included company websites, company annual reports, whitepapers, and financial reports. The analysts have also used a few paid publications such as Bloomberg, Factiva, and Hoovers. To compute the market size, in-depth secondary research is done. Data points such as regional splits and market split by drug type, indication, and distribution channel have been assimilated to arrive at the market estimates. PMR triangulates the data via different analysis based on supply side, demand side, as well as dynamics of cell based assays market. PMR not only conducts forecasts in terms of value, but also evaluates the market on the basis of essential parameters, such as Year-on-Year (Y-o-Y) growth. This helps providers to recognize the future opportunities as well predictability of the market. Vital feature of this report is the analysis of the global cancer supportive care products market by each segment and region; and the corresponding revenue forecast in terms of absolute dollar opportunity. This is traditionally overlooked while forecasting the market. However, absolute dollar opportunity is critical in assessing the level of opportunity that a provider can look to achieve as well as to provide potential resources from sales perspective of the cancer supportive care products market. On the basis of drug class, the report segments the cancer supportive care products market into nonsteroidal erythropoietin stimulating agents, opioid analgesics, anti-imflammatory drugs, anti-infective drugs, bisphosphonates, anti-emetics drugs, monoclonal antibodies, and granulocyte colony stimulating factor. Indication-wise, the market has been bifurcated into lung cancer, prostate cancer, breast cancer, ovarian cancer, leukemia, bladder cancer, liver cancer, melanoma, and others. Based on distribution channel, the market has been classified into hospital pharmacies, compounding pharmacies, and retail pharmacies. Geographically, the report evaluates the potential of demand that can be expected out of the regions of Asia Pacific, North America, Latin America, the Middle East and Africa (MEA), and Europe. According to the World Cancer Research Fund International (WCRF), there will be more than 24 million cancer cases of cancer across the world by the year 2035, and the figures do not include non-melanoma skin cancer. Within the developed country of the U.S., according to the National Cancer Institute (NIH), there were more than a million and half new cases of cancer in the year 2017. Owing to this strong and expanding prevalence of cancer, a number of healthcare organizations have thrown their hat into it and the demand for the products that support cancer care is expanding radically. According to this business intelligence study, the demand in the global cancer supportive care products market will multiply at a CAGR of 4.8% during the forecast period of 2017 to 2021. 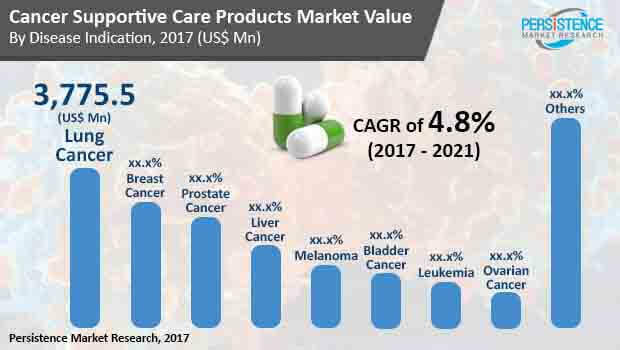 Revenue-wise, the analysts of the report have estimated that the opportunities in the cancer supportive care products market across the world will translate into a revenue of US$ 31,700.0 Mn by the end of 2021, significantly more than the market’s evaluated worth of US$ 26,285.5 Mn in 2017. Apart from the growing pervasiveness of cancer, which has attracted the attention of several organizations and governments alike, the global cancer supportive care products market is driven by several other factors. Some of them include: increasing percentage of geriatric population across the world, greater effectiveness of anti-cancer treatments, increased purchasing power of urban population in emerging economies, and product innovation. On the other hand, entry of biosimilars, extremely high cost of research and development practices, and regulatory barriers are a few restraints challenging the market from flourishing. Nevertheless, the vendors of the cancer supportive care products market are expected to gain new opportunities in the vastly populated emerging economies of Asia Pacific and by increasing their investments in R&D activities. Based on drug class, this report segments the market for cancer supportive care products into opioid analgesics, nonsteroidal erythropoietin stimulating agents, anti-infective drugs, anti-imflammatory drugs, bisphosphonates, monoclonal antibodies, anti-emetics drugs, and granulocyte colony stimulating factor. Among these, the segments of erythropoietin stimulating agents and granulocyte colony stimulating factor are projected to provide for the maximum chunk of demand at 25.0% and 20.2% respectively by the end of 2021. Indication-wise, the cancer supportive care products market has been bifurcated into lung cancer, prostate cancer, breast cancer, ovarian cancer, leukemia, bladder cancer, liver cancer, melanoma, and others. By the end of the year 2021, the others segment is poised to be most profitable, but that will be distributed among various types of cancer. Individually, lung cancer and breast cancer are the two key segments, primed to provide for a demand percentage of 14.8% and 13.6% respectively by 2021. Initiatives by several governments to increase awareness regarding lung and breast cancer is expected to drive growth of these two segments. On the basis of distribution channel, the report segments the market into hospital pharmacies, compounding pharmacies, and retail pharmacies. Geographically, North America dominates the demand in the global cancer supportive care products market. By the end of 2021, the region of North America, backed by the developed country of the U.S., is poised to provide for a demand share of 44.2%, followed by the vastly populated Asia Pacific region at 24.7%. While North America has a robust healthcare infrastructure and high rate of adoption of new technology, Asia Pacific hosts two of the most promising emerging economies – China and India – where disposable income is rapidly increasing among the urban population. APR Applied Pharma Science Research S.A.